Pleasant Valley Farm - Grain, Cattle, and Produce in Maryland. Pleasant Valley Farm is a grain and cattle operation located in Maryland. PVF operates on both sides of the Chesapeake Bay, farming a total of about 2,500 acres of corn, soybeans, and wheat. In addition, PVF also has a herd of about 150 beef cows and runs a produce stand, where we raise and sell our own sweet corn and beef, as well as other locally raised produce during the summer months. 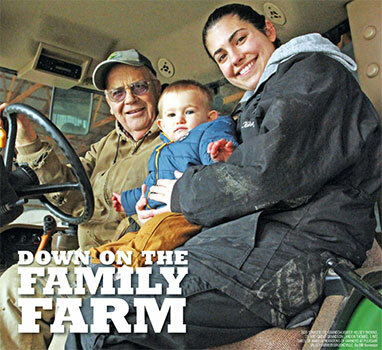 Pleasant Valley Farm is made up of father- son partners, Randy and Bob Stabler. Randy’s 2 daughters, Kelsey and Shelby, both work full time for the farm. Most days Kelsey’s children can be found on the farm as well, representing four generations of farming for Pleasant Valley Farm. Both partners and their families have dedicated their entire lives to production agriculture. Living in such a densely populated part of the country, all members of PVF strive to educate the public on their sound agricultural practices, as well as pass on their true love of agriculture to the next generation.